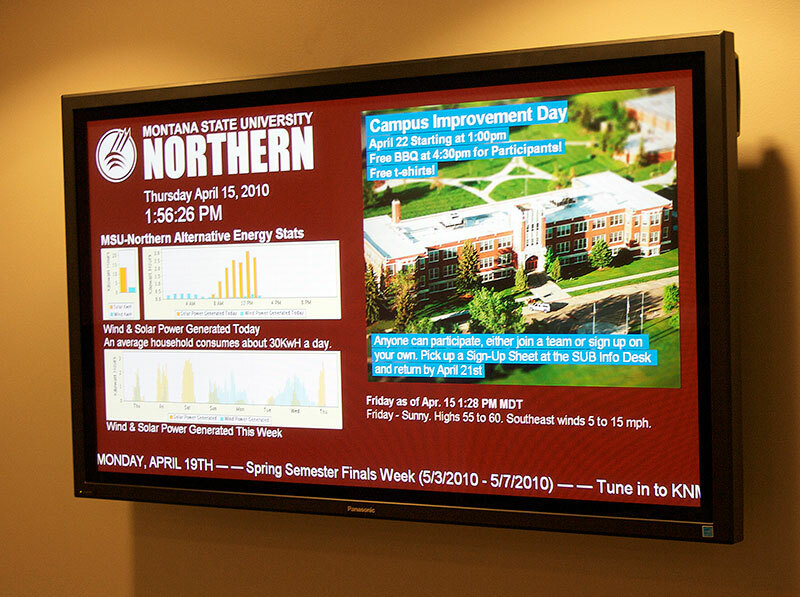 In addition to my normal responsibilities at the Bio-Energy Center at Montana State University Northern, I was also given access to Northern's information displays, a series of networked forty-inch LCDs spread around campus, intended to promote campus events, important dates, etc. The system in place when I arrived was... primitive. A proprietary, unstable, difficult piece of shareware ran the displays; one component the software used was PowerPoint Viewer '97. Installing and using a newer version of PowerPoint on the host computer rendered the display software inoperable. One of the stand-out features I utilized for the display system is the energy generation graph. MSU-Northern's sustainable technology program includes a solar panel and a wind turbine on the campus grounds, both of which are tied into the local electrical grid. A renewable energy technology company, Fat Spaniel, offers an energy "insight platform" that monitors the energy use and production of connected solar and wind generators. Using their web platform, you can create live-updated energy charts. This image is updated live, and represents the energy generated every hour in the last week by MSU-Northern's solar panel and wind turbine.